We finished chicken tractor #2 yesterday and put the chickens out in the yard. It’s great to watch them happily foraging. They were looking a little cramped in the garage. 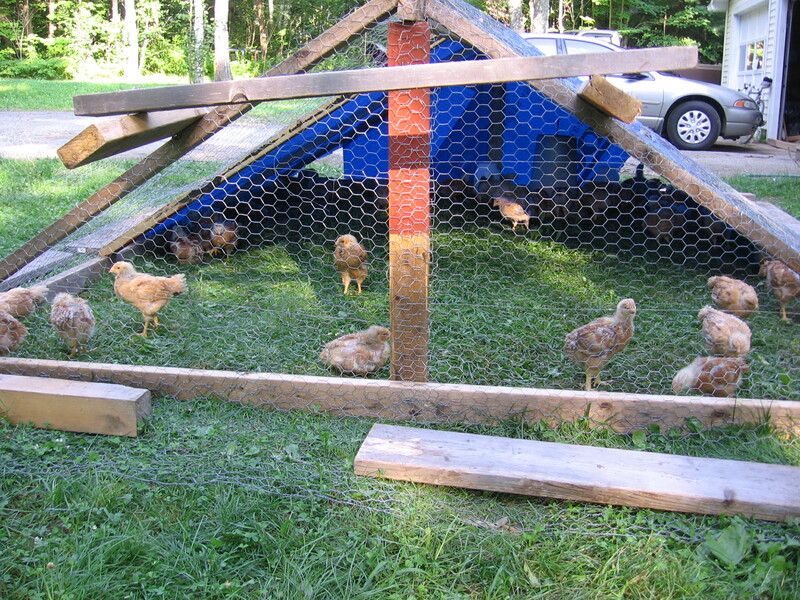 The chicken tractor is simply a frame covered with one-inch chicken wire. We put a tarp over two thirds of the structure so they have plenty of shade. We also laid out chicken wire on the ground around the outside of the chicken tractor so burrowing predators can’t get in to the chickens. 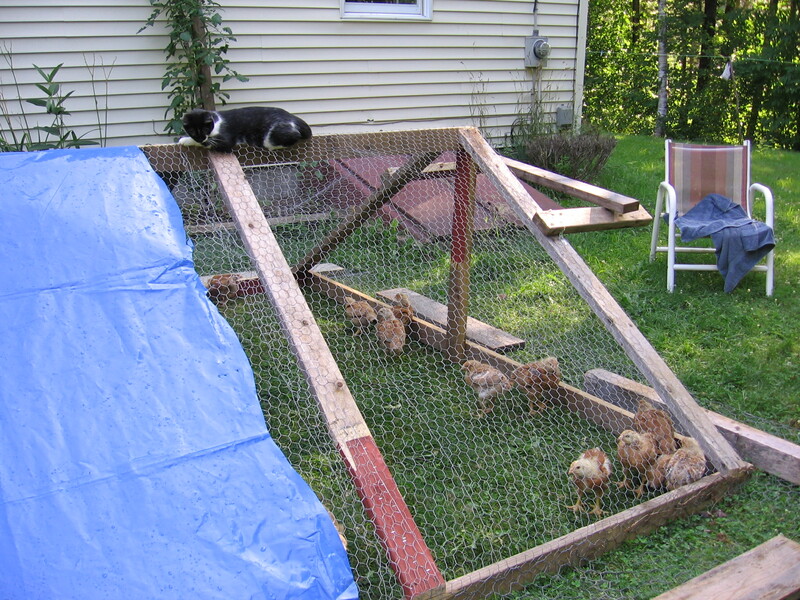 Skunk the cat is very curious about the chickens. She likes to sit on top of the chicken tractor and guard them. We hope that by giving the chickens access to fresh pasture (we’ll frequently move the chicken tractor), they’ll be healthier, happier and tastier. Hopefully they’ll eat less grain as well. It’s the time of summer when there aren’t enough hours in the day. In addition to gardening and swimming and planning a wedding, my job for the Damariscotta Lake Watershed Association is also much more time consuming and busy in the summer. I haven’t had much time to write, though it doesn’t mean nothing is happening in the garden. Some crops seem to grow overnight. 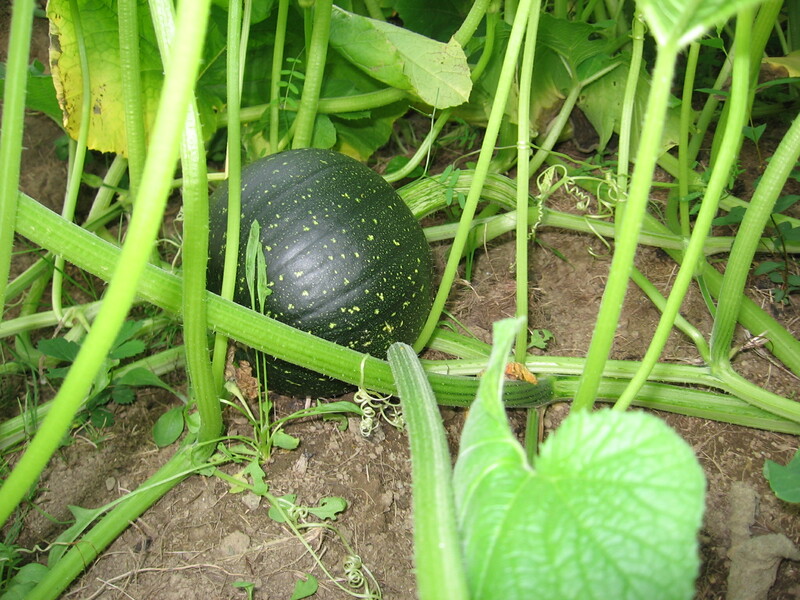 The pumpkins and potatoes are huge. 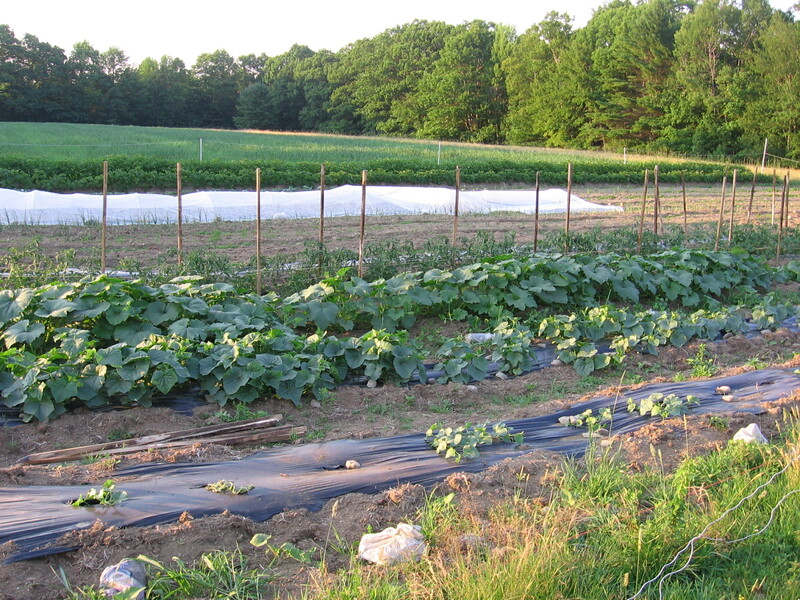 The tomatoes and cucumbers and brassicas look great. But the onions and corn leave much to be desired. We’ve been trying to figure out why the onions have done so little even though they were the first seedlings we put in the ground. My father suggested the problem could be pH. 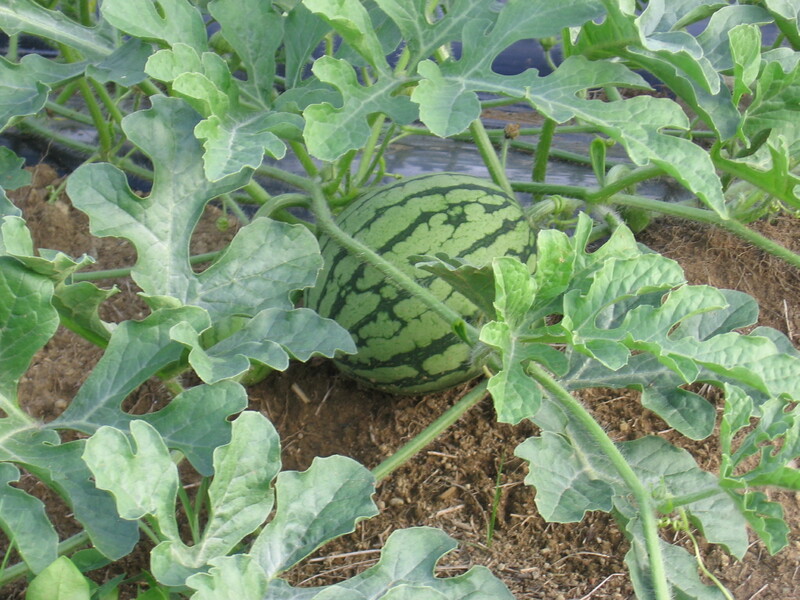 In Maine, soil is often too acidic for optimum plant growth. 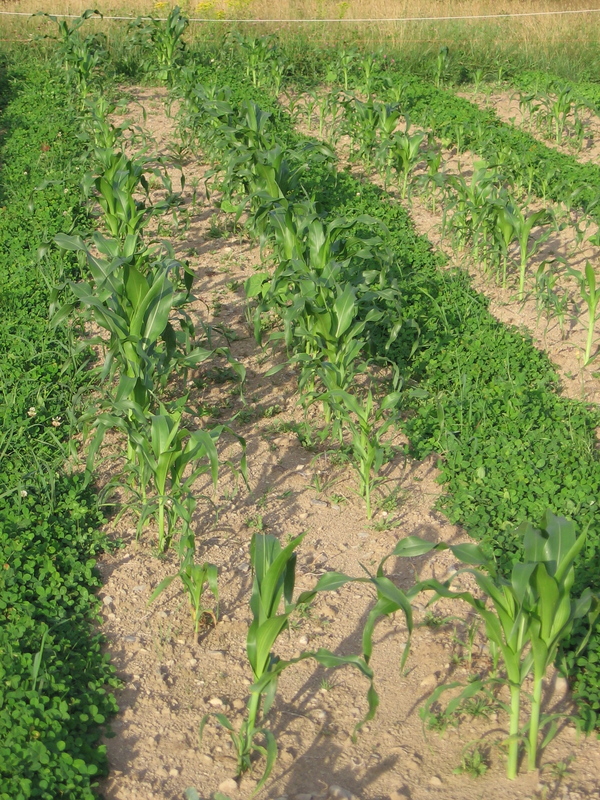 Luckily, soil pH can be easily raised by spreading and mixing in ground limestone. When we got our soil tested in the spring, we found out that the pH was 5.6. We spread 350 pounds of lime and 65 pounds of wood ash (about half the recommended amount) and tilled it in. However, we expect that the lime hasn’t had time to completely do its work. 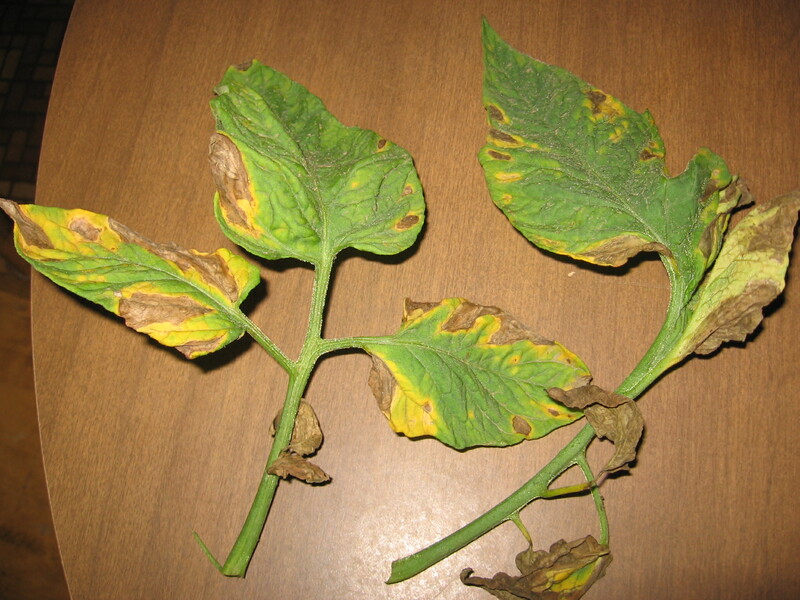 Potatoes are one crop that does grow well in more acidic soils, preferring a pH of 5.5. We didn’t spread any lime in our potato area, and the potato plants are enormous. The onions, however, prefer a pH of 6-7. 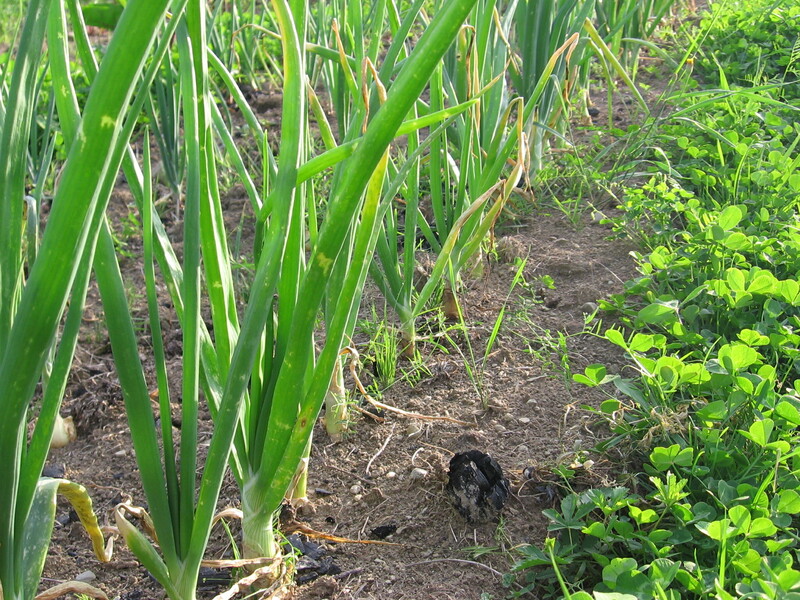 To see if we could solve the low pH in our onion patch, we dumped some wood ash around the plants. Wood ash raises pH and is more water soluble than limestone. We only had enough ash for part of the onion row. Today, after the rain had a chance to wash the ash into the soil, the part of the onion row we treated seems to be greener and larger. Before we spread ash on the rest of the onions, we’ll take a picture so we can assess the results more concretely. We’ve decided to do an experiment with our tomatoes. 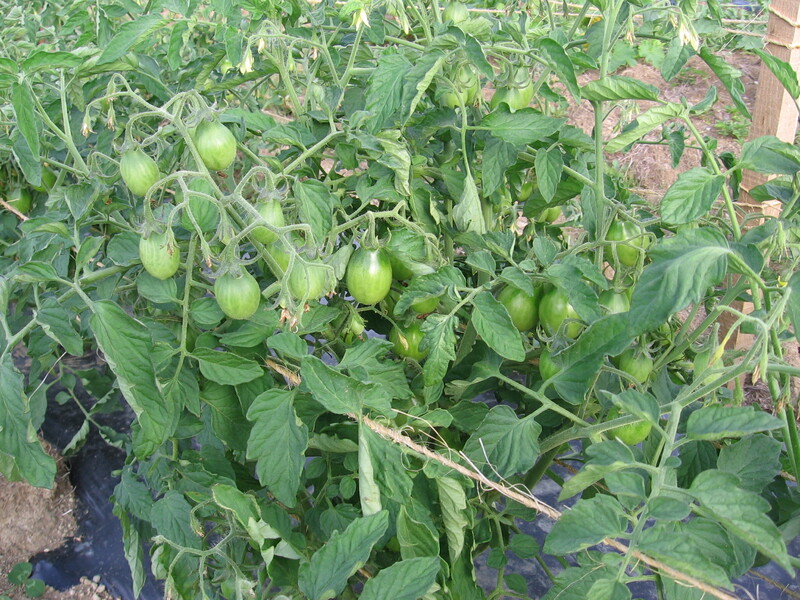 Some people prune their tomatoes to improve their yield. 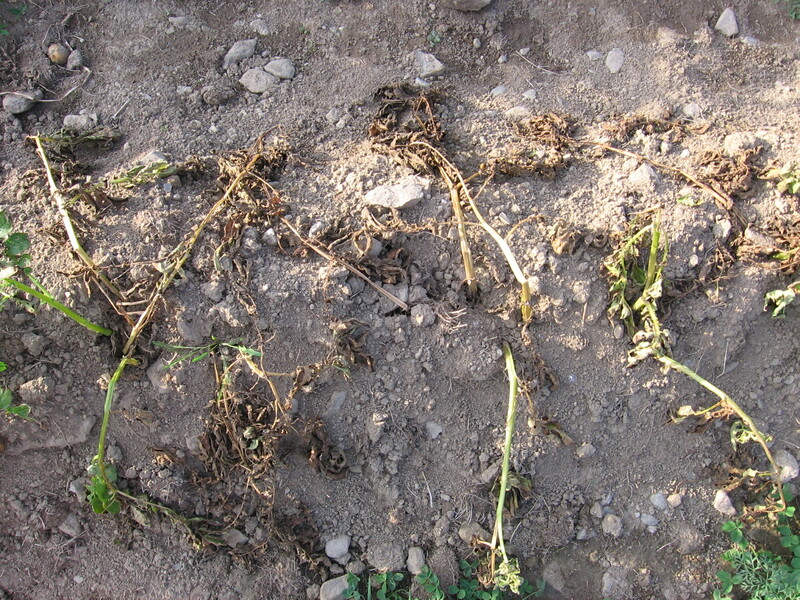 Tomato plants sprout suckers where new leaves leave the main stem. When pruning, you cut these suckers off. I’ve always wondered whether pruning tomatoes really makes a difference. This summer we intend to find out. We pruned one side of the row and left the other half untouched. We’ll weigh the fruit we get from each side. 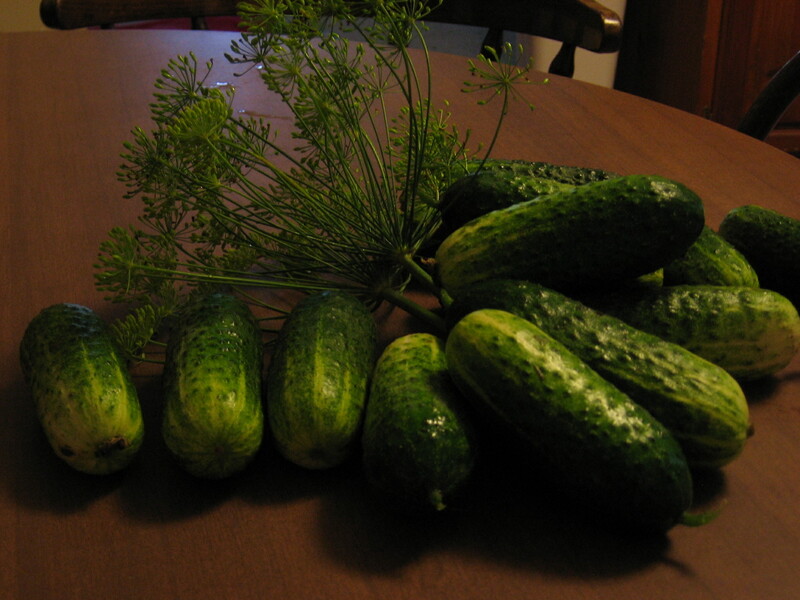 Our first crop is ripening: cucumbers. We were very excited to make our first jar of pickles! 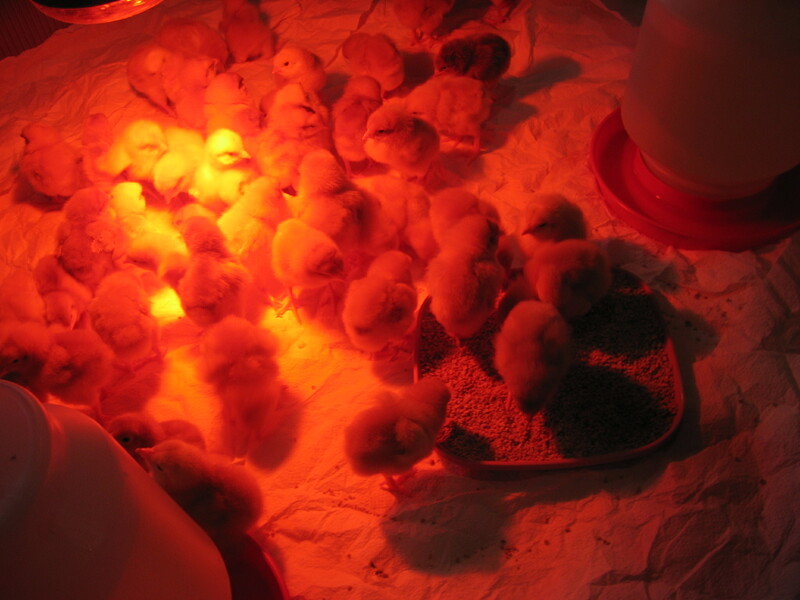 I’ve been adding lots of pictures to the Photos page of chicks, plants and more. Check them out! The call came at 7:30 this morning. “This is the post office calling. We’ve got some chicks for you.” We immediately drove the mile to the post office and picked them up. On the box the packing slip read, 51 chicks hatched the day of the postmark. They were mailed two days ago. Once we got them home, we dipped each chick’s beak in water, which we had prepared ahead of time with a vitamin powder. We arranged plates of food and water containers in the cardboard circle we had prepared inside the chicken tractor, which is inside the garage. Their bedding is a layer of shavings with paper towels on top so they don’t eat the shavings. All the details of how to prepare for them we learned from my parents, who have been raising chickens for years. My mom writes a blog about raising chickens. The chicks almost immediately began eating and drinking. Their instincts are strong. These chicks are meant for dinner. We won’t keep them long enough to get eggs out of them. They are a variety called Freedom Rangers, which are supposed to forage well and produce delicious meat. They don’t grow as fast as the Cornish Cross broilers. It makes me a little sad to know that we’re raising them only to kill them. But I hope they’ll live a happy and safe 11 weeks, with fresh grass and bugs once they get a little older. We plan to keep them in the garage for three to four weeks under a heat lamp (they like to be at 90 degrees in the beginning). Then we’ll move them out to pasture. We’ll move their cages every couple of days so they have fresh pasture. We will roast the chickens whole for our wedding dinner, then carve them and serve. Yum! I can’t wait.